Unam Sanctam Catholicam: Happy St. Patrick's Day! Even though he is a Catholic saint, Patrick was actually born to a Roman Christian family. 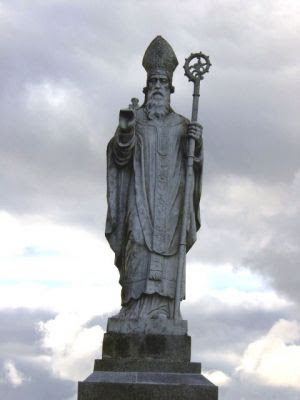 After six years in captivity, Patrick was said to have had religious dreams that told him to escape his captors and convert the people of Ireland to Catholocism. I'm not sure what they are getting at with this, but it would have more weight if Catholicism were not misspelled. Do you have any idea why St. Patrick's Day is NOT a feast day in America? No idea - residual anti-Catholicism?